The MountFocus Keyboard Designer is the ultimate tool for creating onscreen keyboards on the Windows platform. Keyboards created using the MountFocus Keyboard Designer can be used with any application in a touch-screen or normal environment. That makes it ideal for situations where a physical keyboard is either not available or not desired. To get a better view for yourself, download the MountFocus Keyboard Designer now and try it out with your own products and in your own environment. The downloadable file is a fully operational, 30 day trial version. 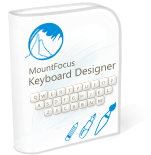 The MountFocus Keyboard Designer package comes with the Keyboard Designer and a Runtime Keyboard system. When you order a license for the Keyboard Designer, you also get 5 FREE Runtime Keyboard licenses. Additional Runtime Keyboard licenses are available at very reasonable prices. Still not convinced? How about FREE technical support by email?